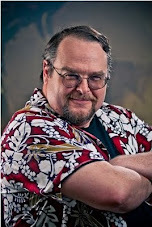 Author and fellow Alliterate J. Robert King is posting a conversation with Ed Greenwood in his Twelve Days of Ed Greenwood. Grognardia has done a retrospective on the Marvel Super Heroes RPG. Now I'm feeling all Old-School. Looking for an instant location for your D&D campaign? How about Calendria? Kinda cool looking. And I've lost some time watching Llewtube. The idea of the podcast is that Robert Llewellyn (Kryten from Red Dwarf) drives people around in his Prius and interviews them. Like Patrick Stewart and Stephen Frye and local officials. Quirky and British and you couldn't do this in LA because after a half-hour you've only gone one exit. And did I ever share with this Close Encounters/Dueling Banjos mashup? Update: The Internets are a wonderful thing. Got an email from Robert Llewellyn saying that he has done some of his "CarPool" shows in LA, both for the web and iTunes. But he stays off the freeways when he does them. Thanks!